New Year's Eve started much like any with Jen making a fantastic meal and me getting home around 11:00 PM to eat it. It ended like many too with us watching that horrible New Year's Eve special. Basically we watch this until I can't stand it any more which takes about four or five minutes. Then it's a race to see how long Jen can stand me complaining about how terrible it is which generally lasts another hour or so. I'm not one to reflect on New Year's about the passing of time or any of that nonsense but each year this horrific slice of television reminds me about how old I am getting by the simple fact that I don't know who any of these people are. 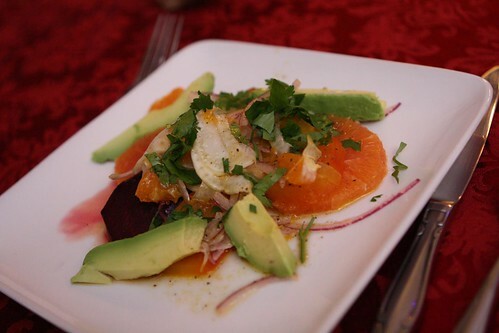 This salad consisted of beets, grapefruit, satsumas, avocado, red onion, and a vinaigrette made by Jen. This may sound like an overstatement but this was quite simply the best salad I have ever had. Maybe this had to do with having to wait until 11:00 PM to have dinner. Maybe it was because it contained nearly all of my favorite ingredients. At any rate I would look forward to having this on a nearly daily basis in 2012. 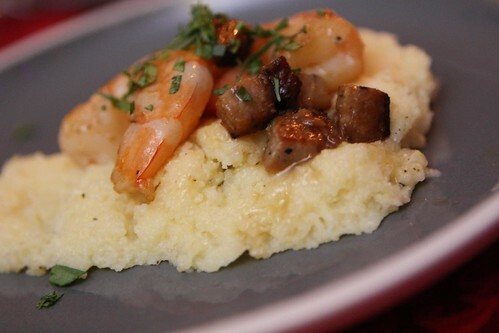 Jen also made shrimp and grits with kielbasa given that tasso was not available. 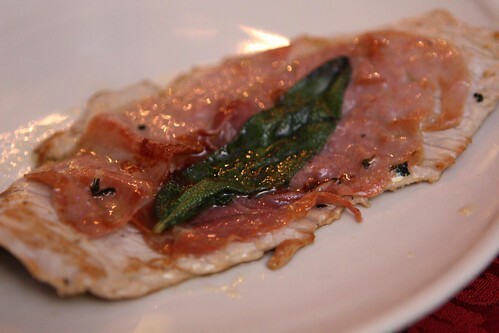 Jen also followed the advice of Lidia Bastianich and made this veal saltimbocca but did not roll it. Also Lidia does not add any sort of cheese to this dish. It was delicious. You can't argue with Lidia! After turning in around 1:00 AM it was a 6:45 AM wake up time for our flight to Illinois! This fact meant that we did not partake in any alcohol for celebratory purposes. 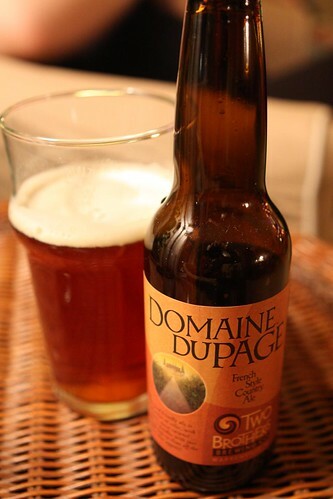 I took care of that when we arrived in Illinois before our Christmas Eve celebration but enjoying the local flavor with this Domaine DuPage French Style Country Ale from Two Brothers Brewing Company which is located the next town over. I was actually astonished at how much it tasted like my home brew which I, regretfully, have not discussed at all on the site yet. After the mad rush of December -- even more rushy than previous years -- January 1st was the first time I had to sit down and relax in the atmosphere of our third (and final) Christmas celebration. 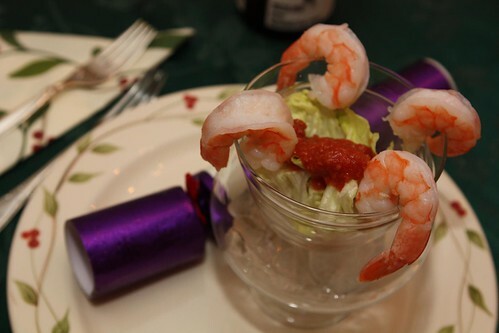 The Illinois brand of Christmas starts with shrimp cocktail made by my father-in-law. 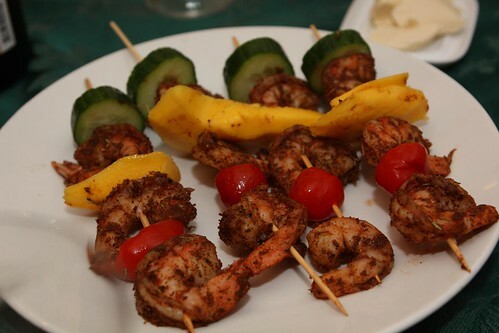 This year he had some extra shrimp and made some Caribbean shrimp skewers with them. This was a nice break from tradition and a way to make Nana, who previously has spent her Christmases in Barbados, feel much more at home. Or away from home. Or however you want to view it. Somehow, over the years, the stories and tales of my turkey carving prowess have been inflated and overblown to the fact that I get this task every year. I would grade my turkey-carving skills as a B- but I appreciate the praise of the family and take on this task with a great sense of pride and responsibility. Since my father-in-law if far better than me at actually cooking turkey I am happy to lend my skills to the completion of the meal. 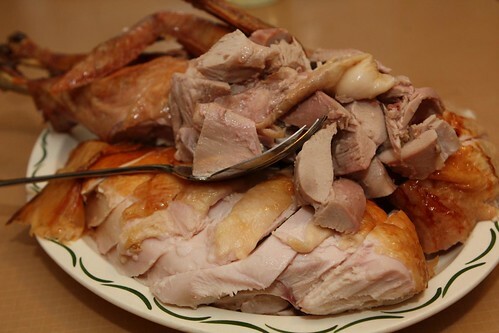 However, I'd gladly trade my carving ability for the ability to be able to cook a turkey properly. I'm still not sure why, with all my years of cooking, I still don't have a system for how to do this in an acceptable manner. 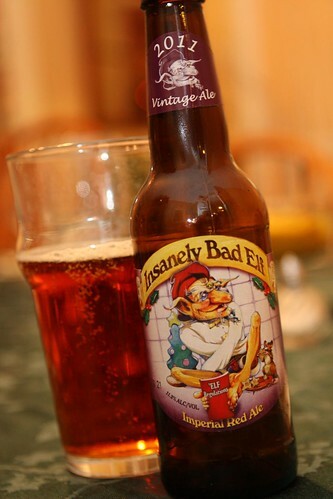 Last night's day-after-Christmas dinner begun with one of my Christmas gifts this Insanely Bad Elf from Ridgeway Brewery and imported by Shelton Brothers in Belchertown, Masachusetts. This is a difficult beer to come by but five bottles are here for me in Illinois. I think I will have to let them age in the cellars here since I cannot really consume five 11.2% alcohol by volume beers in just three nights. The beer was quite good, sweet with a surprising viscosity. Even splitting the bottle with my brother-in-law I felt the effects of it quite quickly. 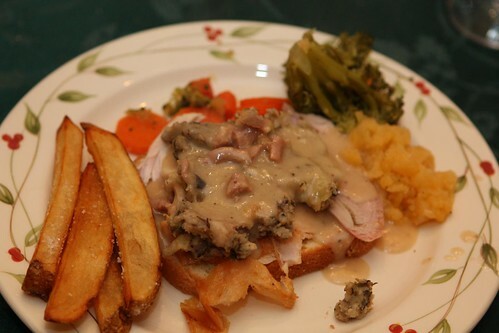 The traditional day-after-Christmas and day-after-Thanksgiving dinners are, as always, a sampling of Jen and my basic philosophical difference in life: our preferred manner of serving a hot turkey sandwich. Still, day by day, we make our marriage work. Marriage is tough, kids! It's all about compromise and acceptance! Keep at it! 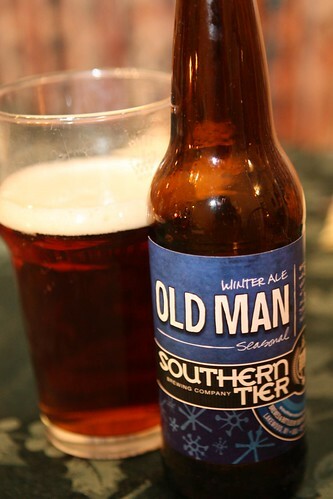 After half a beer (and an hour or two to recuperate) I had this Old Man Winter Ale from Southern Tier Brewing Company. After a week of no beer I was determined to make the most of this vacation by enjoying a sampling of many different beers. That's right, two beers in one night. Things are getting rowdy up in here! 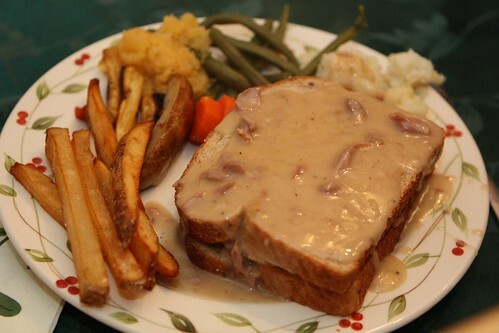 Holy cow, that is some seriously good looking fare! It's still an hour until lunch here today but I don't think I will last now! 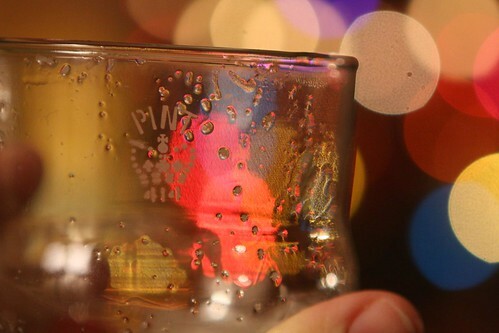 Hope that New Years Eve was awesome - if the food is anything to go by then yes. yes it was!